Add to My Favorite Store. 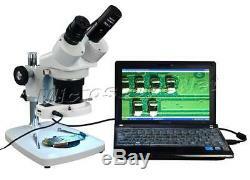 Binocular Stereo Microscope 5X-10X-15X-20X-30X-60X with 54 LED Ring Light & USB Camera. 360° rotatable head ; ring light included. Long working distance up to 4-3/4" (120mm) & large field of view up to 1-1/2" (37.5mm). Cold, bright, shadowless and long lifetime LED cold light with thread adapter. USB digital camera 640x480 with b uilt-in compact 0.45x reduction lens. Plug and see, no special knowledge needed. High quality optical glass elements. Long working distance up to 4-3/4 (120mm). Large field of view up to 1-1/2 (37.5mm). Sharp stereo erect images over a wide field view. Diopter adjustment on left ocular-tube. Tool-free focus knob tension adjustment. Capture live color video on your computer. 640x480 high resolution digital camera. Built-in 0.45x reduction lens approx. Included software allows you to watch, capture and edit images. Field of view: 3.5mm37.5mm with different lens combinations. White/black plastic stage plate: 2-15/16 (75mm) in diameter. Ring light: plastic shell 54 white bright shadowless LED. Matching objective housing size in diameter: 38mm60mm. Best working distance: 38mm254mm (1-1/2"10"). Power input: 100v240v 50Hz/60Hz worldwide range. Ring light adapter: 48mm thread. Camera resolution: color 640x480 pixels. Camera equivalent eyepiece magnification: 15X (with 0.45x reduction lens). Compatible with Windows and Mac OS X (see below for version information). USB cord length: 4 feet (120cm). Dimension: 9" x 6-3/4" x 14-1/4 (23cm x 17cm x 36.2cm). Net weight: 7 lb 7.4 oz (3.39 kg). Package weight: 5 kg & 1 kg. Please check the chart below for computer operating system compatibility. Binocular stereo microscope with WF10X/20 eyepieces. A pair of WF20X eyepieces. Auxiliary objective lens 0.5X. 100v240v wide voltage range power adapter. USB digital camera with 0.45x built-in reduction lens. 1 CD including driver and processing software applications. 30.5mm e yetube conversion adapter. Gooseneck fiber cold light --- get focused strong light. Gem jewel tweezers --- hold jewel, rock, plant. USB camera eyepiece --- take live color photos from computer. Boom stand --- get large free operation room. A: We are happy to leave feedback for our customers once we have been paid and the item has been delivered to the carrier. We would appreciate that once you receive your item, you also leave us feedback. If you feel that you cannot leave a Positive comment with all 5 stars - WE WILL EARN IT. We are here to exceed your expectations! The item "5X-60X Multi-Power Binocular Stereo Microscope +54 LED Light +USB Digital Camera" is in sale since Tuesday, May 13, 2014. This item is in the category "Business & Industrial\Manufacturing & Metalworking\Semiconductor & PCB Equipment\Inspection Equipment". The seller is "bh542" and is located in Northeast. This item can be shipped to United States, Canada, United Kingdom, China, Mexico, Germany, Japan, France, Australia, Denmark, Romania, Slovakia, Bulgaria, Czech republic, Finland, Hungary, Latvia, Lithuania, Malta, Estonia, Greece, Portugal, Cyprus, Slovenia, Sweden, South Korea, Indonesia, Taiwan, South africa, Thailand, Belgium, Hong Kong, Ireland, Netherlands, Poland, Spain, Italy, Austria, Israel, New Zealand, Singapore, Switzerland, Norway, Saudi arabia, Ukraine, United arab emirates, Qatar, Kuwait, Bahrain, Croatia, Malaysia, Chile, Colombia, Costa rica, Panama, Trinidad and tobago, Guatemala, Honduras, Jamaica.